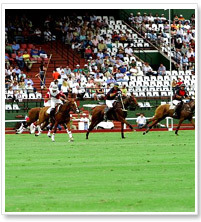 "Southampton ... America's Polo Playground"
Southampton Hunt & Polo Club was founded in 1989. It is now one of the largest polo clubs in America. The club's goal is to provide fast, competitive, fun polo in a pleasant social environment. SHPC offers low to medium goal polo from May thru mid October at its facilities in Southampton. During the months of January through March it offers indoor polo at nearby Two Trees Stables & a limited outdoor program in Wellington, Florida. From June through September the club runs monthly 2, 4 and 8 Goals leagues; and 10 and 12 Goal tournaments are scheduled later in the season. For beginners, SHPC offers a structured introductory program that starts with the basics of the sport and gradually advances through more advanced levels to full field play. Instruction is provided by the club's staff of international professionals This program has been extremely successful in attracting new players to the game. SHPC is located 110 miles east of New York City in the Town of Southampton, the heart of The Hamptons, America's premier resort area. The club is 4 miles from some of the most beautiful beaches in the world and is surrounded by picturesque villages where the best of entertainment, sports, shopping and fine dining can be found. Facilities at SHPC consist of 3 full fields, 2 stick & ball areas, an outdoor arena and exercise track. The club boards 200 horses. The club is open 6 days a week, Tue. thru Sun. with organized play on Wed & Fri evenings and on Sat & Sun. SHPC also operates a full service horse farm for the breeding and training of polo ponies. Grooms and lease ponies are available through an independent operator at the club. Beginner Program conducted by Professional Polo Players.